Pan American Leathers, Inc. is an exotic skin tannery, wholesaler and retailer founded by Mark Mendal in 1984. Following in the footsteps of his father, Jack, who opened his first exotic skin tannery in 1951, Mark has leveraged modern technology and three generations of technical expertise at our tanneries in New York and Colombia to make PAL a leading quality tanner of exotic skins for the world's markets. Our relationships with both suppliers and customers span many decades and continue to grow as PAL works with clients to meet the demands of an ever-evolving marketplace. Pan American Leathers tans, colors and finishes alligator skin, anaconda skin, various crocodile skin, lizard skin, python skin and more at our New York tannery and caiman skin at our Colombian tannery. We distribute a wide variety of other exotic skins for foreign tanneries in the USA market. Customers can buy from stock on our website or at our showrooms or make-to-order at our tanneries. Panamleathers.com is intended to educate you on who we are, where we came from and how we can help you, as well as to serve as a convenient online shop for all your exotic skin needs. 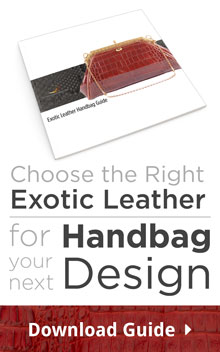 Now, we encourage you to learn more about exotic leather, our business and explore our product lines. We sincerely hope that the variety and quality of our skins and our commitment to customer service meet your needs. President & CEO, Pan American Leathers, Inc.
How Much Will Your Bag Retail For? How Many Square Feet of Skin is Required To Make Your Bag? What Skins Will Work For You? Below are the skins that should fit your budget and target value. Feel free to email us at info@panamleathers.com with any other follow up questions.